May 30, 2017 – It looks like it’s going to be a hot one. Cool! We’ve had enough wet and cold to last us until it’s wet and cold again. 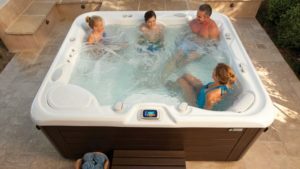 As summer heats up, hot tub owners tend to shun their daily soak, but it doesn’t have to be that way. With a few minor adjustments you can still enjoy all the benefits you love about your hot tub, even in the summer. Cool it down. Those temperature settings you love (102° or 104°) are great for most of the year, but not cool enough for those warm summer nights. Simply dial it down a few degrees and your body will feel the difference. With a little experimentation you can find the perfect Comfort Zone for a refreshing soak during those late summer evenings. Drop it down even further, and you can turn your hot tub into a “Cool Pool”. Be forewarned, this strategy will make your hot tub very attractive to kids and grandkids. Feeling achy? Take a break. In the summer we tend to be more active, so there’s an even greater need to carve out some hot tub time. Whether you work out, take a run, or work in the yard, your hot tub is still a wonderful way to soothe those aching muscles and rid your body of lactic acid build up. If it’s hotter than hot, give your body time to stop sweating and your heart rate a chance to return to normal before you soak. You’ll be better equipped to withstand the heat and maximize your hot tub session. Get that water in you! Hot weather. Hot tub. It’s easy to get dehydrated. You want to be well hydrated to begin your session, so start gulping before you ever start soaking. Bring an ample supply of your favorite refreshing beverage with you into your hot tub. Continue to hydrate, even after you soak. Your body will be glad you did. But—skip the booze. Hey, you know, summertime, party time…don’t be tempted to indulge at the height of the summer in the heat of your hot tub. Not only will that glass of wine dehydrate you, but you’ll be more likely to get drowsy. And that’s a little TOO relaxed. Better to sip after you soak. The pleasure of hot tubbing doesn’t have to be a three season affair. There’s plenty of enjoyment to be had year round, even on those lovely summer nights. Just follow our tips to get the relaxation and good night’s sleep you deserve.